The latest compact SUV takes the funky design route to stand out from rivals, explains Craig Thomas. New car buyers are mad for SUVs at the moment, with the more compact models currently the fastest-growing segment in Europe. Carmakers are currently busy responding to this demand with a host of new models: in the next few months we’ll see the Seat Arona, Skoda Karoq, Hyundai Kona and Kia Stonic all hitting our showrooms and competing for buyers’ bucks. Also in the running is the Citroën C3 Aircross, which is an interesting proposition, not least because it’s an unlike-for-unlike replacement of the French brand’s C3 Picasso model, which was a compact MPV. Another consumer preference that the C3 Aircross addresses is the demand for a wide range of personalisation options – in this case, 85 exterior colour combinations (which could prove useful for fleets using liveried vehicles) and five interior choices (four of which are options). The use of colours such as Spicy Orange is an indication that Citroën is aiming for that elusive youthful, active lifestyle market – elusive because young people can’t afford new cars, unlike fleet owners. So despite the C3 Aircross looking like more of a retail proposition, Citroën does anticipate that almost half of its market will be fleet. However, it also predicts that around 75% of buyers will go for petrol engines, rather than diesels, which suggests that at least half of fleet buyers will turn their backs on oilburners and instead opt for one of the three variants of the 1.2-litre, three-cylinder PureTech engine fitted in the C3 Aircross. The pick of the trio is the turbocharged PureTech 110, which produces 108bhp and has an 11.3-second 0-62mph time: however, it still manages a fuel economy figure of 56.5mpg (50.4mpg when mated to a six-speed automatic transmission) and emissions of 115g/km. This is the version we tested, finding it perfectly usable (if not exactly quick), even when faced with mountainous roads. Diesels take the form of a pair of Citroën’s 1.6-litre BlueHDi. The lower-powered 100 variant has an official fuel consumption figure of 70.6mpg, while the 120 returns 68.9mpg. We drove the more powerful version and found it somewhat lacking in any gutsiness, often struggling uphill, so we dread to think how the 100 might cope. 410 litres to 1,289 litres. One criticism, though, is that the interior trim is something of a mish-mash of different materials, with a few too many brittle plastics. Citroën has kept the model line-up simple, with just three versions – Touch, Feel and range-topping Flair – and there are some useful features that are standard across the range, such as DAB, Bluetooth, lane departure warning and cruise control. There are also some handy features available as options – the pseudo-4WD Grip Control with Hill Descent Assist stands out – but some are a tad pricey (£950 for a full-length sunroof?). 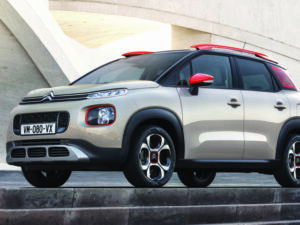 The C3 Aircross is entering a very competitive market and although its funky design does create a point of difference, that alone might not be enough for it to stand out.